Young or old, everyone loves the peanut butter and jelly combo. The classic American flavor pairing can be found in sandwiches, cookies, oatmeal and today, even a delicious protein shake, thanks to Chef Geo from ProTreats. 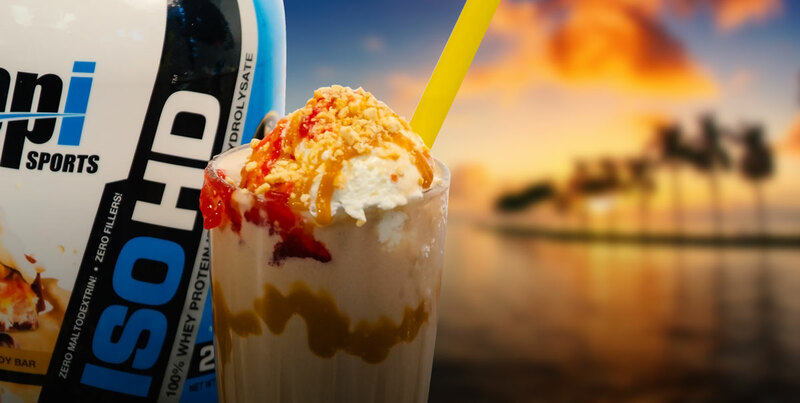 Chef Geo uses BPI Sports’ ISO HD™ protein powder to maximize the protein amount in the shake and, of course, boost flavor. ISO HD™ is pure and low calorie, made up of 100% whey isolates and hydrolysates, so it’s rapidly absorbed and perfect pre- or post-workout. Rim the inside of your glass with the caramel topping as you turn it. Use a blender to mix the BPI Sports ISO HD™ protein powder, cashew milk, stevia drops and peanut butter. Pour the mixture from the blender onto the caramel-rimmed glass. Add the Cool Whip, the leftover caramel, strawberry topping and finally, the granola, for that extra crunch. Viola! An irresistible Peanut Butter and Jelly Protein Shake! For more delicious protein shake recipes, check out Chef Geo’s Blueberry Caramel Protein Shake. Chef Geo is a member of Team BPI Sports.